The Briar Patch has a little catching up to do. Our excuse is that the Briar Patch’s physical location has moved. More about that later. But for now, fortunately, faithful correspondent Bob Moyer has taken time from his own travels to write a review. WHAT YOU BREAK. By Reed Farrel Coleman. Putnam. 357 pages. $27. Ever since Raymond Chandler sent his fictional gumshoe Philip Marlow down the means streets of Los Angeles, hard-boiled writers have been pushing their PI’s down the same path. Reed Farrel Coleman’s Gus Murphy follows in those same footsteps, only in a different locale – Long Island. Slava is one of those people. A Chechnyan who claims to be from Poland, Slava says with a ”…face turned headstone-cold,” “I am shamed in my soul.” Now his past has caught up with him, and he needs Gus’ help. He saved Gus’ life in the last book, so Gus has no choice. Gus also has no choice except to help an acquaintance of Father Tom, the ex-priest who helped keep Gus alive. He asks Gus to help Micah Spear, like Slava, a broken man who has broken men. He’s “…distant, superior, knowing with hints of blackened soul,” but Gus agrees to help him find out why his granddaughter was killed. These two tasks take Gus and the reader into the dark side of both sides of the tracks on Long Island. Out of Coleman’s’s pen, L.I. proves as atmospheric as L.A., with the “…Long Island Expressway acting as our own version of the Mason-Dixon Line.” As Gus wends his way through plot complications, we get a tour of the place, as well as why “…a trip out to the Hamptons …becomes a test of a person’s road-rage threshold.” When he crosses the railroad tracks in Bellport, Gus points out that they “…might just as well have been a wall or a moat, but you didn’t need physical barriers when economic ones were just as effective and far less conspicuous.” Coleman is a master of noir that sheds light on society. After a crackerjack car chase in which “…’shotgun’ wasn’t just a figure of speech,” and a two-man assault on a barricaded site that has “the stink of heated rubber and plastic” as well as the “rank odor of sweat and fear,” Gus discovers the reason behind the girl’s murder on the way to extricating Slava from a death penalty. The price he pays is worth it, for him and the growing cadre of his fans. 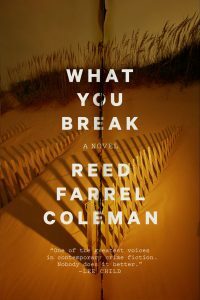 This entry was posted in Detective fiction, Mysteries, Thriller/Suspense and tagged detective fiction, Reed Farrel Coleman, What You Break. Bookmark the permalink.